Top Requesting Lessons	How Do I Manually Set a Lesson Request Time? If you would like to place a lesson request for outside of the tutor’s set availability, you can directly input the date and time once you have an agreement with your tutor. Please note: You can only use this feature if the tutor allows exceptions for lesson requests outside of their set availability. 1. 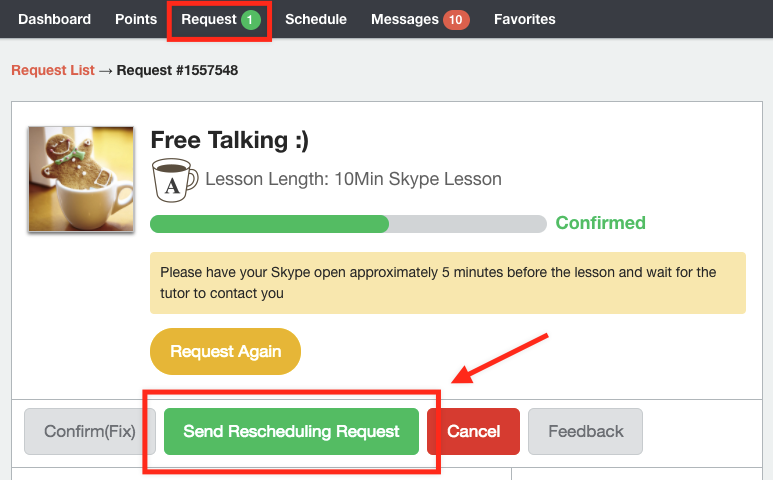 Click the "Request lesson" button, which will take you to the tutor’s available schedule. For more details on lesson requests, please refer to "Cafetalk Help - Lesson Requests". Click on lesson "Request lesson" and move on to the tutor’s available schedule. If your request has already been coonfirmed, you can click on the "Send Rescheduling Request" button on the request page, which will again take you to the tutor’s set availability. For details on rescheduling a confrimed lesson time, please refer to "Cafetalk Help - Cancelling or rescheduling a lesson". 2. On the tutor’s calendar, click on “Manually set Lesson Request Time”. On the tutor’s available schedule click on “Manually set lesson request time” and a calendar where you can directly input your desired lesson date and time will appear. Selecting the lesson date and time you agreed upon with your tutor on the displayed calendar will take you to the request confirmation page.